Through the use of voice-over and onscreen narration, interviews, maps, images, documents, reenactments, key locations, and appropriate music, this documentary will examine a crucial incident in the evolution of Native American civil rights. The Fall Creek massacre took place in 1824 near Pendleton, a town in Fall Creek Township, Madison County, Indiana, when a mixed group of nine Native Americans was killed by seven white men, most of whom were subsequently brought to trial for the murders. The resulting legal actions, which rose to the level of the Indiana Supreme Court, led to conviction and execution of the main defendants. The various courts’ decisions established a precedent for punishment in cases of white aggression toward Native Americans. The ramifications of the Fall Creek massacre and subsequent legal actions reached far beyond Indiana and have influenced state, regional, and federal treatment of Native Americans during subsequent generations to the present day. In late 1823 and early 1824, a small party of Native Americans arrived in the area near Pendleton, in Madison County, Indiana, to hunt and collect maple syrup. The local white settlers developed a friendly relationship with the band, which included Chief Logan, two other men, three women, two boys, and two girls. Thomas Harper, a frontiersman who came to the area in 1824, convinced four other men to attack the band near their camp. This they did on March 22, 1824. Two of the Indian men were shot and killed, while the third Indian man escaped. The women and children were then killed. Harper and his group stole everything of value from the Indian camp and returned home. The murders were discovered the next day. The settlers feared retribution from the Native Americans. However, within a week the perpetrators were captured, except for Harper, who escaped the area. While the accused awaited trial, William Conner and John Johnston traveled to the local Indian villages to assure the people that the men who had murdered Logan's band had been caught and would face justice. James Hudson was the first of the accused to be tried. The trial was held in the Madison County Court. He was found guilty and sentenced to hang on December 1, 1824. He appealed his case to the Indiana Supreme Court, in Corydon. The court issued an opinion, written by Chief Justice Isaac Blackford, that upheld the lower court's decision. The decision of the Supreme Court established precedent for punishment in cases of white aggression towards Indians (The Encyclopedia of Indianapolis, 1994). Soon after the Supreme Court rejected his appeal, Hudson escaped, but was recaptured 10 days later. On January 12, 1825, he was executed before a large crowd that included several Native Americans. The remaining men were tried on May 9, 1825 and were all found guilty and sentenced to hang. One of those found guilty was John T. Bridges, Jr., a youth of 17. The jury recommended that he be pardoned. A petition on his behalf was submitted to the Governor of Indiana, James Brown Ray. It was not until the appointed date of young Bridges' execution that the Governor, himself, arrived in Pendleton to pardon him. “The Massacre at Fall Creek” (tentative title) opens with a scene-setting segment, locating the story both geographically and historically through the use of visuals and narration. This introduction includes a reenactment of tribal life among the families at the center of the story, a tribal mix led by Chief Logan. This group had traveled to Madison County, Indiana, from Lewis Town, Ohio, in the fall of 1823. The scene segues to the farm of John Johnston in Piqua, Ohio. A reenactment portrays Johnston, using his own words taken from his written account of the massacre that was sent to the U.S. Department of War. Johnston, the Indian Agent originally appointed by President Thomas Jefferson, plays a central role in the unfolding drama. Viewers see Johnston’s narrative come to life in reenactments and visual images. The third segment portrays the incident of the massacre through a mix of narrative voices and accompanying images and sounds. Added to the words of Johnston is commentary by noted historian Dr. David Murphy. The next segment delves into the reactions of others—the local community, the state—to the massacre. The central topics are race hatred and rule of law. Images and narrative carry the story forward to the apprehension within three days of the killings of six of the seven alleged perpetrators. The scene segues to events following the capture of the accused killers, including the summoning of Johnston, the Indian Agent, to help calm the increasingly tense situation between local native peoples and the communities of white settlers living near the scene of the massacre. Johnston’s words, drawn from reports, letters, and memoirs, are central to the portrayal of events leading to the trials of the alleged killers in Indiana’s Fifth Circuit Court. The sixth segment uses images and narration, incorporating Johnston’s words, to set the scene for the legal actions. Each of the accused men was tried separately. But the action was not solely within the courtroom, as the trials were influenced by a mixture of political ambitions, land speculations, and public concerns about the consequences of the jurors’ decisions. 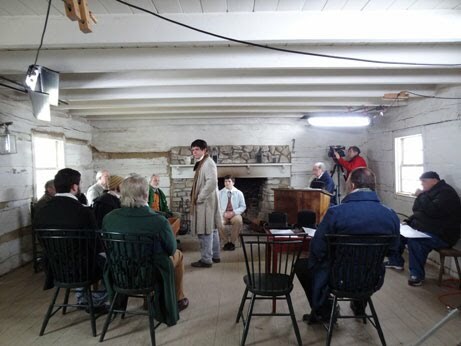 There follows a segment that reenacts an interview with the condemned Hudson by a writer named Samuel Woodworth, based on Woodworth’s pamphlet, The Life and Confession of James Hudson. The scene segues to a narrative account of the executions and the importance of the trials and consequences in the scope of Native American relations during the westward movement in the decades immediately preceding the Civil War. A dramatic reenactment helps close the action: the last-minute reprieve by Indiana Governor James Ray of John Bridge, Jr., an 18-year-old who had just watched the hangings of his father and his uncle. A narrative conclusion brings the documentary to a close.